As Super Typhoon Yolanda looms over the Visayas, it brings to mind the wrath unleashed by Typhoon Uring upon the City of Ormoc in Leyte twenty-two years ago on November 5, 1991. While families were having lunch in their homes on what seemed like any other ordinary day, floodwaters suddenly rushed in over bridges and dikes and into the streets. In a matter of minutes, the water rose to about 10 to 12 feet high. The strong current carried away container vans, cars, trees, and other debris, destroying houses and other structures that stood in its way. 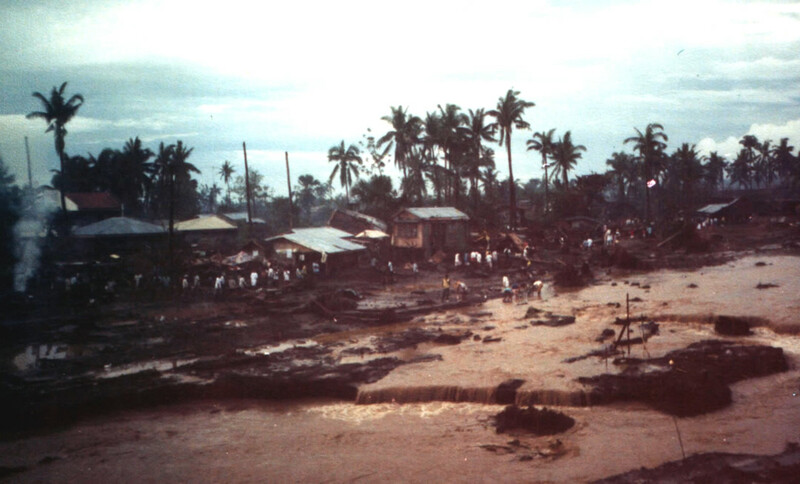 The flash flood that inundated Ormoc that day claimed an estimated 8,000 lives. I was only nine years old when it happened but the memory of the darkness and desolation that engulfed the city where I spent most of my childhood is emblazoned in my mind. On the day of the flood, I was spending the semestral break at my grandmother’s house in Cebu. Since the flood had caused a total power and communication blackout, none of us knew what was going on in Ormoc until my mother, Gwen Garcia, was able to make the very first communication out of the city through an Ultra High Frequency (UHF) radio which she and my father, Winnie Codilla, happened to have for use in their business. Through the radio, she was able to contact her brother, Winston Garcia, who was then a Board Member in Cebu, and relay to him and former Cebu Governor Lito Osmeña, the tragedy that had befallen Ormoc. When her messages were aired live on Cebu’s Radio dyRC in the days following, the world finally found out about the killer flood and the dire situation faced by hundreds of thousands of Ormocanons who had survived with nothing more than the clothes on their backs. Help from Cebu, Manila, and the rest of the world descended upon the city. I did not fully comprehend the magnitude of what had happened in Ormoc until my grandmother brought me, along with my brother and cousins, on a big boat headed to the city shortly after the flood. After a few hours at sea, I had grown anxious and bored and asked my grandmother to buy me something to drink. Before I knew it, we were approaching Ormoc’s shores. I remember I was drinking an orange Hi-C when I spotted something floating on the water. Many people thought it was the carcass of a dead animal. As it turns out, it was the body of a little boy, bloated, pale, barely recognizable. To this day, I cannot bring myself to drink Hi-C. The scene at the Ormoc Port was even more horrendous. Muddied and decomposing bodies were stacked up in piles along the entire stretch of the pier. I did not know whether to close my eyes or to look, to speak or to be quiet, to stare or to cry, because whatever I did I knew I would be horrified. There was no escaping this horrible reality. Even with my eyes closed, the stench of death pervaded the air. Everywhere the city was bathed in mud. There were remnants of pillars where houses once stood, people in tattered clothing rummaging through debris, rows of empty cars lined up on opposite ends of broken bridges. The sea wall of this beautiful city by the bay where families enjoyed many a Sunday afternoon was now a repository for dead bodies that have washed ashore. Ormoc City in Leyte bore the brunt of Typhoon Uring’s wrath. The entire landscape of Ormoc had changed. An entire barangay atop an islet called Isla Verde was wiped out along with thousands of residents save only for a few. Anywhere you asked, someone had lost a mother, a father, siblings, sons and daughters. This was a truly defining moment for the city and its people. While some life events so traumatic are best left to the recesses of memory, in this case, it is necessary to look back and to remember the great flood – not to sow panic and incite fear for what lies ahead, but to be reminded of the signs of life that survived after. This fight for life persists in Ormocanons who continue build upon the now vibrant and dynamic city borne out of that flood. It perseveres in the Boholanos and Cebuanos who themselves have just been through a cataclysmic ordeal and have lost no time to rebuild. And it has proven itself unwavering in Filipinos across the country and all over the world who somehow always prevail against all odds. We live in perilous and interesting times. As we brace ourselves for the perils that lie ahead, we need only to look back in order to move forward – certain that in this fight for life, we will not only survive, we will thrive.